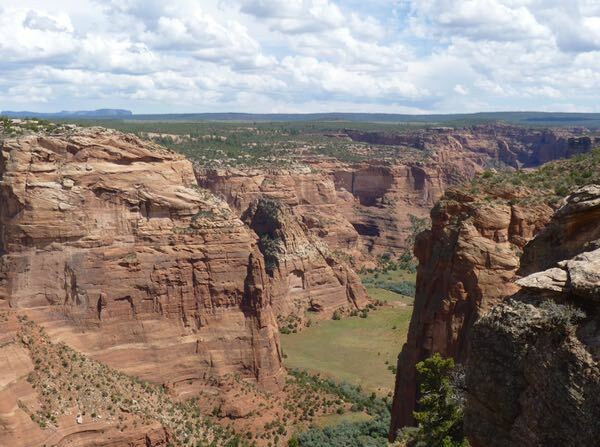 The South Rim drive, at Canyon de Chelly National Monument, takes you to several more overlooks stretching over 15 miles. 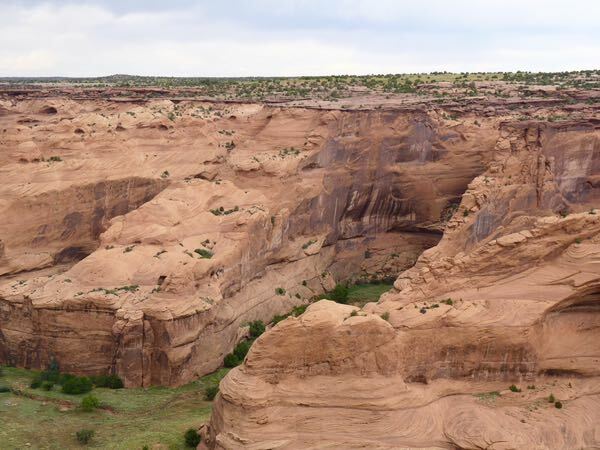 The canyon walls start at about 30ft, and gradually increase to over 1,000ft deep. At the bottom are streams, trees, and small farms with livestock, gardens, orchards, out-buildings and summer homes. 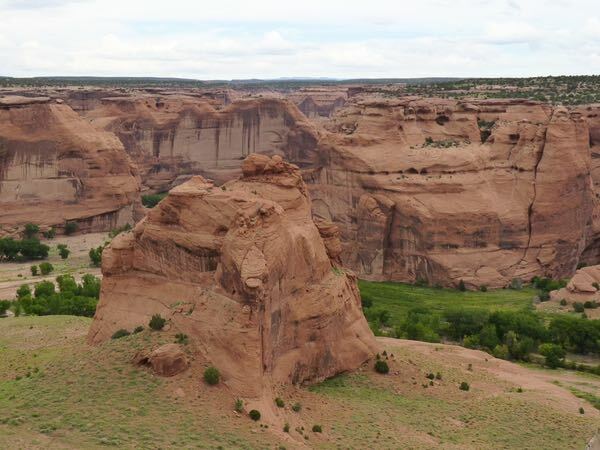 A parking lot at each viewpoint, and a short trail took me to the canyon edge and a feature. Each stop had something different to offer. Often there were natives trying to sell their crafts. 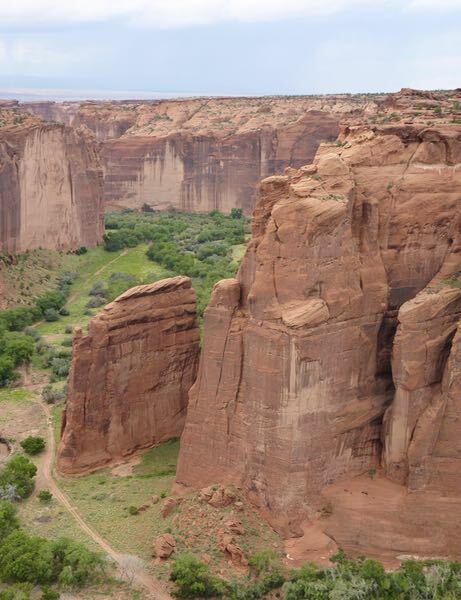 An 800ft tall rock formation, called Spider Rock, stands where Monument Canyon meets Canyon de Chelly. 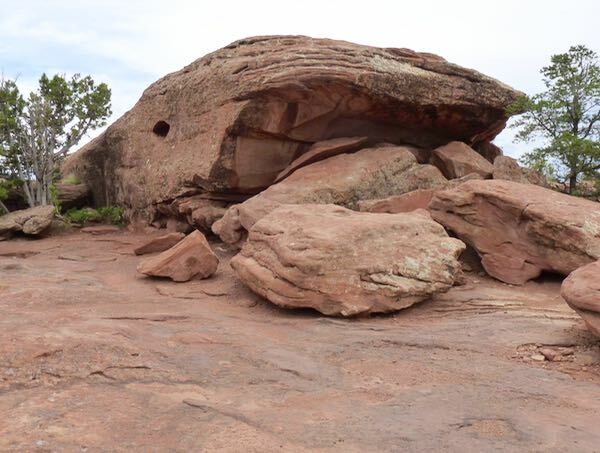 Navajo tradition says that Spider Woman, who lives atop the rock, taught them how to weave. To the left is Face Rock which tells Spider Woman the names of naughty children. 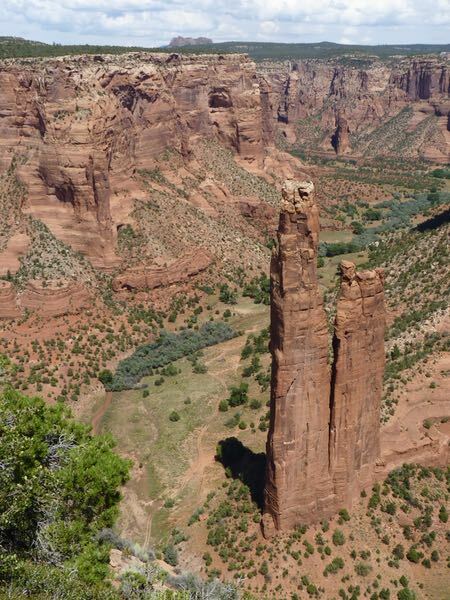 She then carries them to the top of Spider Rock until they behave. The ruin was built on a sloping ledge, so the original builders constructed retaining walls to prevent the structure from sliding into the canyon; hence the name Sliding House. 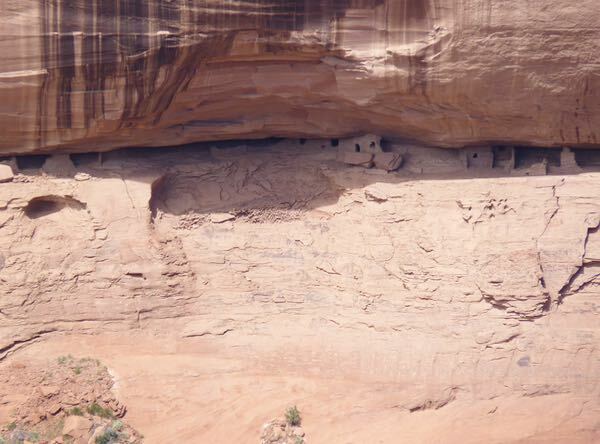 The cliff dwelling and pueblo ruins on the canyon floor comprise White House. Some rooms still have white plaster walls remaining. 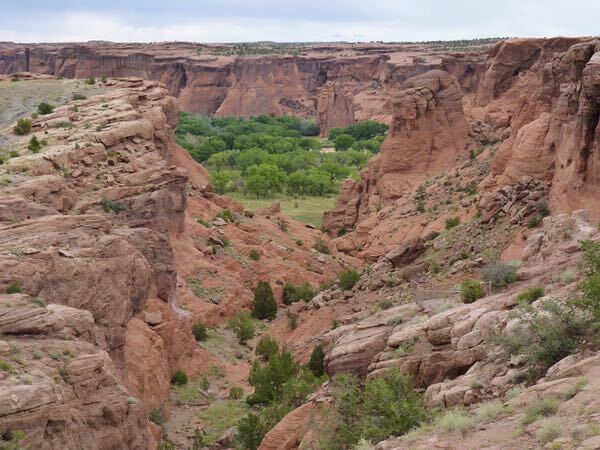 At this overlook is the only trail into the canyon open to the public. It began raining just as I arrived, so I thought it unwise to scramble down the 600ft cliff on the clay surfaced trail. 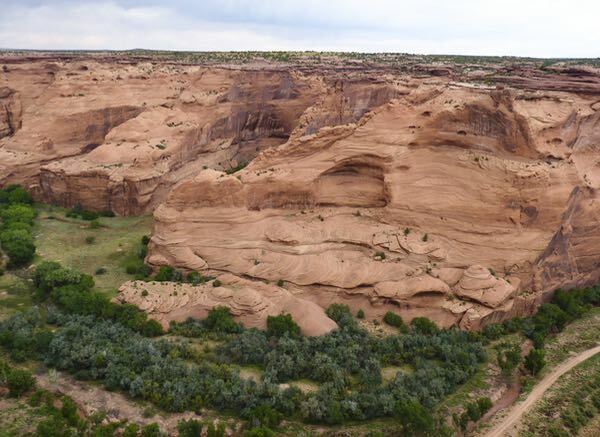 This ruin is at the junction of Canyon de Chellly and Canyon del Muerto. Also there, was the first ruin discovered by archeologists. 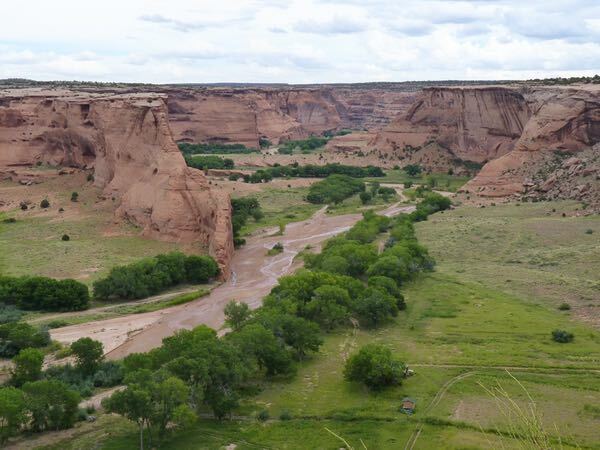 At Tsegi, farms in the canyon are easily seen, along with the seasonal river. 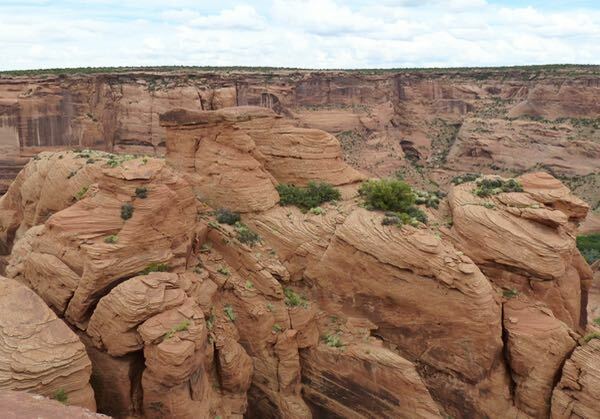 The canyon is about 275ft deep at Tunnel overlook. 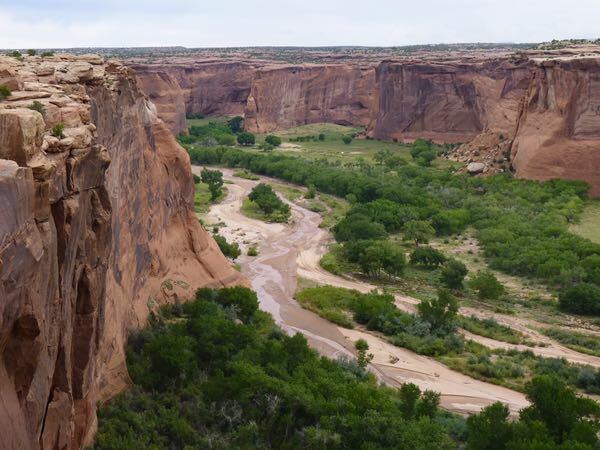 By turning around, the Chinle Valley can also be seen. Amazing; the colors are stunning! There are no signs of fall colors yet? I was there the first week of September, and at an elevation of about 5,500 ft it was too soon to see fall colors. Still, it was a stunningly beautiful place.